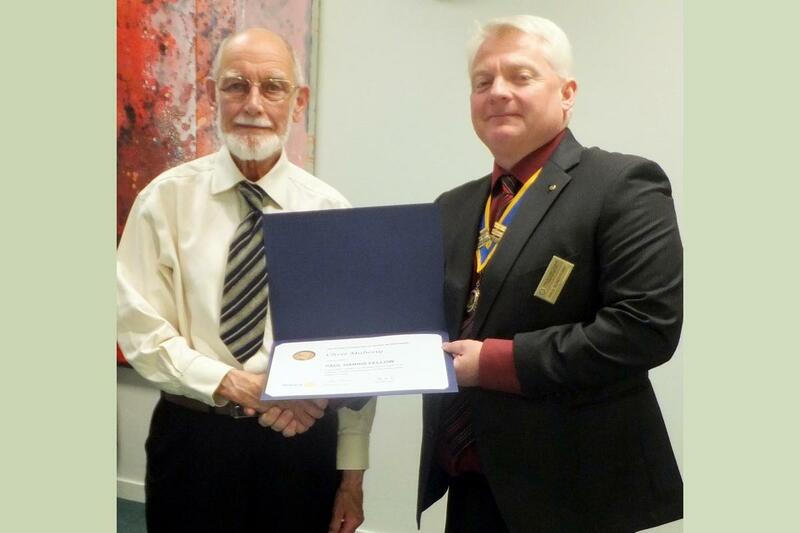 In Chris Mahony, we have lost an exceptional Rotarian. He embodied all that is good about Rotarians and was a particular support to me during my time organising Young Musician for District. When I was President, I co-opted him onto Club Council because I knew he would always do what was best for the Club, rather than following a personal agenda. When I presented the Walker of the Month trophy, I nicknamed it Chris.This was only partly a jest, but I thought the character reflected Chris’s stoicism and preparedness to attend events and projects whatever the difficulties. He will be sorely missed, as he has been over the past couple of years. I was very sorry to learn of the death of Chris Mahony. When I first came to Northampton 1st June 1986, as Borough Chief Executive, Chris was a member of the Council’s Management Team. He and his small staff at Northampton Transport were busily preparing for the enforced transfer of the bus undertaking under the Transport Act of the previous year. Much of the preparatory work had already been done by the time I arrived, as the transfer date of 26th October 1986 was only a few weeks ahead. It was a very demanding time for Chris as he fulfilled his duties to the reluctant Council while at the same time getting ready to continue his role in the new company, which he did for years thereafter. Despite this, he made time to welcome me, and to help me understand the issues involved in everything that was happening. I am so sad to hear that Chris has died, he was such a wonderful man, who has done such a lot of good things in his life. I shall miss Chris very much. I worked with him on the Young Musician project and was most impressed with his organising abilities but also his willingness to listen to others. He always had time for you. I felt such sadness in my heart, he was such a kind gentleman and was always there for everyone. He will be in our thoughts and remembered for a long time. - Hazel Zaman. The extent, to which Chris went encouraging and supporting entrants to the Young Musician of the Year, knew no bounds. He displayed humanity of the highest quality. I feel privileged, to have been able to have worked alongside him, in achieving one of the goals of Rotary. - Caroline Morris. As the legal representative from 1966 to the then Borough Council Transport Committee, which was responsible for Northampton Corporation Transport, its buses, and the St James Depot until its sale in 1986, I can perhaps claim to have had longest direct contact with Chris since his move to Northampton to succeed T. P. O’Donnell as its Transport Manager. It was a very different time and a different régime, with an elected Member obsession with the trivia of bus operation and service, repeated union difficulties and the need for constant juggling with local pressures, constraints and compromises, at which he excelled. Chris took Union meetings at the Depot, operational difficulties and Council Committees with a variety of Chairman of both political divides in his stride, always with time to fairly deal with staff and operational problems alike. The Borough Bus service under his stewardship was then a very profitable one for ratepayers, to the point where the tide of national legislation forced a reluctant decision to require the disposal of such municipal operations. Here again, with apprehension, I was tasked with the formalities of the major sale of the Bus Company in circumstances in which Chris, though less than happy, bore philosophically, continuing, despite his reservations, to provide all necessary help and assistance to achieve this. With the Company went the management and staff which transferred, and even today I recall with some conscience the final formal meetings at which the documents were signed in front of Chris and his senior staff transferring them rather like chattels! Chris bore this major change with equanimity and went-on to lead local management for his new Employers for a number of years. Chris was an enthusiastic Chair of the Youth Committee, introducing the Rotary Stars programme to the club and organizing The Young Musicians Competition for several years. He was meticulous in his organization. Chris was a details man. He worked on the principle that if you get the detail right, then the big picture will be OK. He regularly proved this to be correct. Memories come back of him getting a suitable piano shipped int the Competition Hall early on Sunday morning; of interviewing RYLA candidates late in the evening in his front room. He was getting the detail right. Chris was President of the club in 1998-99. His President’s Weekend was in Abergavenny, a light-hearted weekend which include a walk on the Sugar Loaf. Chris was a great walker. He was one of the initial walkers on the First Rotary Walk, and he became a regular participant, always appropriately kitted for whatever our changeable climate might present. Later when weekly walks developed as in-fills to the monthly club walk, Chris enthusiastically joined in. His attention to detail was again a strength when he took his turn as walk leader. Once he spent several hours investigating the bad habits of alpacas, a group of which we were to pass! Chris loved being out in the countryside, but the walks were more than that. Group walking was the perfect vehicle for Chris’s personality. Being gregarious and convivial, he would move from one cluster of walkers to another to engage in friendly chat – he was never short of a topic of conversation or a story to tell. If the group was small, there were always passers-by or residents in local gardens! In 2013 Chris was awarded a well-merited Paul Harris Fellowship. It was an award of which he was immensely proud. The last two years were difficult ones for Chris, and for Pat. His failing health prevented regular attendance at club meetings, but he never lost interest in what the club was doing. Some of us met with him from time to time and, poignantly, a lunch had been arranged at the Cromwell’s Cottage for the week after he died. He had been looking forward to it – I think, for him, a sort of mini-Rotary meeting. Chris’s funeral took place on April 14. A large number of Rotarians were present to show our affection and respect. Two of our members, Roger and Peter, worked alongside Chris when he was Transport Manager for Northampton Borough Council and have paid warm tribute to him on our website. Their sentiments were clearly shared by many. The large congregation at the crematorium filled the chapel to overflowing and showed the respect of the men and women who had worked with and for Chris in the Public transport sector. Many had arrived in the vintage red double-decker bus parked in the car park. Chris would have relished that!